'Isolation' is the word most synonymous with this remote and rugged British outpost marooned in the middle of the South Atlantic. Such is its remoteness, almost equidistant between Brazil and Angola, St Helena was chosen as the place of exile for its most famous resident - Napoleon Bonaparte. Taking advantage of a newly-built airport, this trip explores the far-flung wilds of the UK's second-oldest overseas territory. Well-placed for the former East India Company shipping routes, the island has a rich history, rugged windswept coastlines and a forested interior home to endemic flora and fauna. Small towns dot the island and the welcome received from the 4,000 'saints' that live here is legendary. We begin our trip in Johannesburg, the largest city in South Africa. After meeting our Explore leader and fellow group members we spend the afternoon in Soweto, the huge township on the outskirts of Johannesburg where 40% of the city's inhabitants live. Soweto, originally an acronym for South Western Townships, played a prominent part in the fight against the former apartheid regime, notable the Soweto Uprising of 1976; when mass protests erupted and the government shot at the crowd, killing many innocent protestors. We will take a tour of the township and meet local people to understand how life has changed since the end of apartheid. We will visit the Hector Pieterson Memorial, a museum that honours the vital role that the youth of South Africa played in the struggle. Hector Pieterson was one of the first students to be killed during the uprising when he was just 13. We will also visit the Mandela House Museum, situated in Nelson Mandela's former home which tells the story of Mandela and his family. We will transfer back to the airport this morning for our flight to St Helena. The idea to build an airport on St Helena came to fruition in 2010, where the British Government invested £285 million pounds of public money to fund the building project. At that time the only way to get on and off the island and transport produce was by ship, the 5-day journey to Cape Town aboard the RMS St Helena. The airport was set to start welcoming commercial flights in 2016, but the project was delayed due to windshear. Additional safety measures were put in place and on the 14th October 2017 St Helena welcomed its inaugural flight - the SA Airlink Embraer running a weekly service from Johannesburg. It is hoped that this flight will boost the tourism industry, providing vital jobs and a source of additional income, as well as increasing the ability to transport provisions to the remote island. Upon arrival into St Helena we will make the short drive to Jamestown, the island's capital and our base for the week. This afternoon we set off for a gentle stroll around lower Jamestown to orient ourselves and as an introduction to the island and its people. We will stop by the Castle, St James Church (the oldest Anglican Church in the Southern Hemisphere) and see Jacob's Ladder - a 699 step pathway that climbs steeply out of the valley Jamestown sits within. The afternoon ends with a telling reminder that we are in a British Overseas Territory, with a nice of cup of tea! Completely un-inhabited until 1502 when it was discovered by the Portuguese, the volcanic island of St Helena was established as a British territory in the 1600's to serve as a stop off on the main East India Company shipping routes. Aside from a very short-lived occupation by the Dutch, the island has remained under British rule for over 350 years. Its isolated location leant itself as an ideal detention centre for some of the British empire's most-feared enemies, including Zulu warriors, several thousand Boers from the Boer War and of course the island's most famous captive, Napoleon Bonaparte. British colonial influence is evident everywhere on the island, and today we set off to explore some of St Helena's main sights. We start at St Paul's Cathedral, and with a capacity of 450 people it is rather smaller than its London name-sake, but is a charming church serving the local community. Moving on we visit the Boer Graves, a cemetery located in a peaceful wooded glen dedicated to the Boer prisoners that were shipped to the island during the Boer War. We stop for packed lunch in a scenic spot where the lush peaks loom over us. We then visit SHAPE - a not-for-profit organisation that supports vulnerable adults and disabled people, where a variety of handicrafts are made from local and recycled materials. At Prince's Lodge we find a fascinating Castel collection of old prints and photographs, offering a window into the past of this British outpost, and depicting the many people that have visited here over the years. Here we break for afternoon tea. The day ends with a stop at Ladder Hill Fort, the old fort atop of Jacob's Ladder keeping watch over Jamestown in the valley below. Located in the middle of the South Atlantic, St Helena is one of the most remote islands on earth, some 1,900 kms from the coast of Angola to the east, and 2,800 kms off the coast of Brazil to its west. Its location in the sub- tropics provides ideal waters for a rich marine eco-system, and today we take to the waters around St Helena to discover this. We hope to spot a variety of marine birds today, such as the red-billed tropic bird, fairy terns and brown noddys, as well as seeing some of the early coastal fortifications put in place to see off foreign invaders. As we cruise the western coast of the island, there is a good chance to spot dolphins playing in the water, as numerous pan-tropical dolphins swim in these waters, as well as small numbers of bottlenose and rough-toothed dolphins. This afternoon we visit Rupert's Valley, known for its coastal fortification and links to the slave trade. In 1833 the British Empire abolished slavery, but at that time it still existed in the United States of America. In an effort to supress the trans-Atlantic slave trade, a naval station was deployed on St Helena and many ships were subsequently intercepted, with thousands of liberated slaves being brought to the island to recover. Sadly the conditions on the ships were so appalling that many were already dead, or dying when they were rescued, so Rupert's Bay is now the site of mass graves. It is estimated that St Helena liberated nearly 25,000 slaves, some of whom decided to stay on the island to work and make a life in St Helena. The official home of the Governor of St Helena, Plantation House is a beautiful 18th Century mansion. Built in the style of a colonial summer house, its sashed and shuttered windows look out onto extensive gardens habituated by Jonathan the roaming tortoise, and its 24 rooms contain a wealth of period furniture, memorabilia and a considerable amount of history from over the years. We spend time exploring this former governor's residence with the house's expert guide. This afternoon we set off west, stopping for a packed lunch en-route. Our afternoon walk hugs the coastline along the peaceful and isolated western part of the island, and ends at the South West Point looking out to Speary Island and the vast South Atlantic Ocean beyond. The walk will be a total of 8kms, which we anticipate to take us around four hours over gently undulating terrain. This morning we drive out to Deadwood Plain, the site of one of the largest Boer camps on island. From 1900-1902, St Helena was selected to host nearly 6,000 Boer prisoners of war. Many of these were based in large encampments on Deadwood Plain, although once they were established many were given jobs around the island, with some of them even moving in with the locals to act as servants and maids! Deadwood Plain is also the main habitat of the island's only endemic land bird, the St Helena Plover, or 'Wirebird' as it is known locally. Prior to human occupation St Helena was home to 9 endemic birds, but since goats and other outsiders were brought to the island, many of the endemic plants and wildlife were wiped out, with the endangered Wirebird the only unique land species left. We drive across the plain where there will be a very good chance of spotting the bird with the help of our National Trust guide. During the late 18th and early 19th Century, St Helena became a site for a series of conservational experimentation, with extensive reforestation of endemic plants, and attempts were made to boost rainfall artificially. This intervention has been closely linked with establishing the roots of environmentalism, and this afternoon we visit Millennium Forest, where trees are being planted to re-establish an ancient forest. Here, we join the cause and have the opportunity to plant a tree of our own, personally helping to revive St Helena's ancient forests. After lunch we visit High Knoll Fort, the largest military installation on St Helena, and at 584 metres it is a prominent feature as you travel around the island. The fort is substantial in size with wells, living quarters, stables and of course, a number of gun emplacements. Ironically, the fort never had the chance to fulfil its purpose as since its construction St Helena was never invaded. Aside from housing some of the more unruly Boer War prisoners, it has remained unused, acting only as a deterrent, and now, a place of interest. Day 7 - Morning walk in the central peaks with lunch at Ladder Hill. Afternoon free. This morning we set off for a walk to 'Central Peak', located in the island's lush forested interior. There is a good opportunity to spot some of the island's endemic plants, such as cabbage trees, tree ferns, and we hope to see the tiny blushing snail, found only on St Helena and the Ascension Islands. We climb up to the highest point on the island(823 metres), and if the weather is clear we will experience sweeping views of the island below, with most of the landmarks visible from the peak. Please note some sections of this walk are fairly steep, and the terrain can be slippery if wet or misty. The walk is around five kilometres in length, and we anticipate it to take around four hours. We end the walk with lunch at Ladder Hill. The rest of the afternoon is free to relax or further explore the island. Day 8 - Morning discovering Napoleonic sites including his original tomb. Afternoon free to visit Jamestown museum. After his defeat in the Battle of Waterloo in 1815, St Helena was chosen as the place of exile for Napoleon Bonaparte, appearing a much more isolated location than the Isle of Elba, from which he escaped from one year previous. He arrived on the island later that year, and lived out his final years on the island, dying in 1821 at the age of 51. He spent his first few months at Briar's Pavilion, before moving into Longwood house where he remained until his death. It was Napoleon's wish that his remains be brought back to France to be buried on the banks of the Seine, but this was refused, with the-then Governor stating that he should be buried in the Valley of the Willows, St Helena. In 1840 however, the French obtained permission from the British government to return Napoleon's remains to France, where they now rest in Les Invalides, Paris. This morning we immerse ourselves in the fascinating last years of the great Emperor's life, visiting both of his residences and his tomb in the peaceful Valley of the Willows. This afternoon has been left free to explore Jamestown, a visit to the Jamestown museum is highly recommended. The museum does an excellent job in charting St Helena's 300+ year history with its collection of informative and visual displays. Day 9 - Free morning in Jamestown before flying to Johannesburg. Check-in to hotel. After a leisurely morning we make our way to the airport for our return flight to Johannesburg, transiting via Windhoek. We'll check into our hotel in Johannesburg, where the rest of the evening is free after the long day of travelling. Today has been left free in Johannesburg. St Helena sits in the sub-tropics but the climate is tempered by the South-Easterly trade winds which blow throughout the year. Temperatures in Jamestown hover between 21-28 degrees centigrade year round, but temperatures in the more exposed central and southern parts of the island are often five or six degrees lower. A light raincoat is recommended, along with trail shoes or walking boots for the various walks on the island, as the terrain can be slippery when wet. The temperate generally hovers around 20-25 degrees centigrade but it can drop at night, so a fleece or jumper is advisable. Whilst there are no beaches, there may be opportunities to swim on the boat trips so packing swimwear is recommend. Trail shoes or walking boots are recommend for the walks. We recommend you bring a sunhat and sunscreen as the sun can be strong. A water bottle is essential. A torch, travel towel and an umbrella may come in useful. You may wish to consider walking poles for the various walks avaialble on the island. Although entirely voluntary, tipping is a recognized part of life on St Helena. Some local staff will look to members of the group for personal recognition of particular services provided. In order to make things easier for you, the Tour Leader may organise a group's tips kitty and if this is the case, they will account for it throughout the tour. Accordingly, you should allow £30 GBP per person. The local currency is the Saint Helena Pound which is linked at parity with the British Pound (Sterling). Sterling is accepted in some outlets and restaurants around the island, but change will often be given in local currency. Money can be exchanged at the Bank of St Helena in Jamestown. None. Cash advances can be made against credit or debit cards for a charge in the Bank of St Helena, Jamestown. Credit and debit cards are accepted in a few of the restaurants and outlets, but shouldn’t be relied upon. Can be cashed at the Bank of St Helena. Please be sure to change your money back to Sterling before leaving, as St Helena Pounds cannot be changed when back in the UK. New Zealand passport holders do require a visa, please consult your local consulate for full information. Other nationalities should consult their local embassy or consular office. Please ensure you have the correct multiple entry visa, especially if you are visiting another country on your itinerary and will need to re-enter South Africa - this includes visiting St Helena. All visitors should ensure their passport is machine readable and has two blank pages when entering and leaving South Africa. The South African Immigration officials will not allow child/ infant pages to be used for this purpose and visitors without the stipulated blank pages will be denied entry. 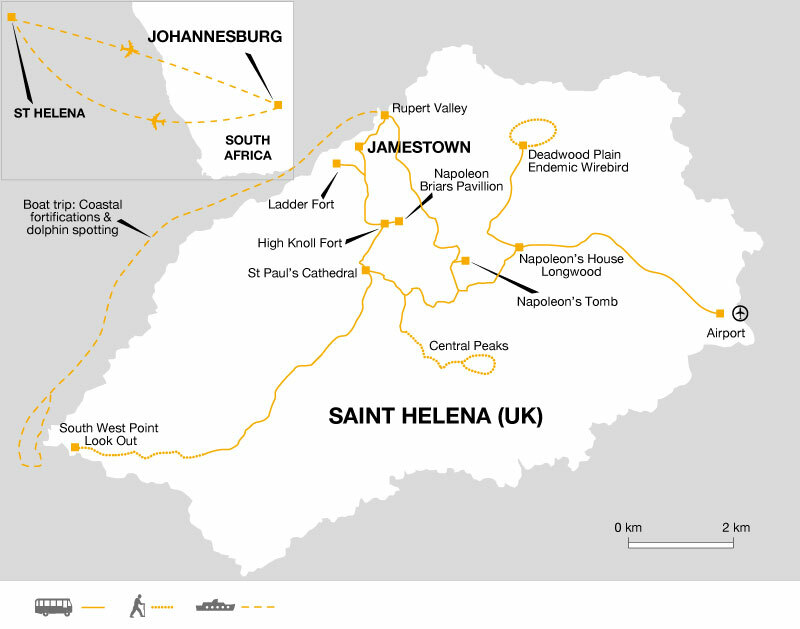 St Helena: All visitors are required to purchase an entry permit on arrival in St Helena. The permit costs £20.00 and is valid for up to 6 months. You must provide proof of a return ticket, travel (medical) insurance, sufficient funds for your stay and your Explore final documents for adequate accommdation arrangements. Please note you are required to have a minimum 6 months remaining validity on your passport from the date of entry into St Helena. Please note all persons over the age of 1 years old will be required to present a yellow fever certificate that has been issued at least 10 days prior to arrival in St Helena if you have travelled from or via a country where yellow fever is endemic. We recommend protection against hepatitis A, tetanus, and typhoid. Please check the latest requirements with your travel clinic or doctor prior to departure. The above is not an exhaustive list. Further information regarding vaccinations and travel health advice can be found by following the NHS and NaTHNaC links at Explore Travel Health and from your local healthcare provider. Visa and vaccination requirements are subject to change and should be confirmed by you before travelling. Having never visited St Helena before, this trip will be run in the form of a 'recce tour' where we will explore the island together. This trip is ideal for those who love remote and isolated locations; St Helena only received a mobile network in 2016! Its rugged coastlines and forested interior lends itself for those who enjoy walking and the great outdoors, and its historical role within the empire provides plenty for those interested in history. Please note certain elements of the itinerary are still being finalised and the exact running order of excursions and days may be tweaked to maximise your experience.